Freekeh is wheat harvested when still young and green, then roasted and rubbed to remove the grain from chaff. It has a special smoky flavour and is quite rich in fibre and protein. It is traditionally cooked as a stew, however chefs of modern Middle Eastern cuisine are reinventing this ancient grain and using it in salads and as a replacement to rice. On my last trip to Beirut I tried freekeh in a salad and I loved the texture, so I decided to add it to my pantry when I get back home. Wash barberries well and soak in a 1/4 cup of water. Soak pistachios in 1/2 cup of water. Wash freekeh well then cook with 5 cups of water, bring to boil and simmer for about 30 to 45 minutes. Remove when cooked but still firm. Rinse in cold water and drain in a colander for about 10 minutes. Put in a bowl. In the mean time, slice carrots into julienne slices then dice. Dice cucumber and red capsicum into small pieces. Chop shallots and tear the parsley and mint. Put a tiny drizzle of olive oil in a pan and pan fry the cashews and macadamias stirring on low heat until golden, add the pine nuts towards the end as they roast quickly. Drain the barberries but retain the juice. Drain the pistachios discarding the water. 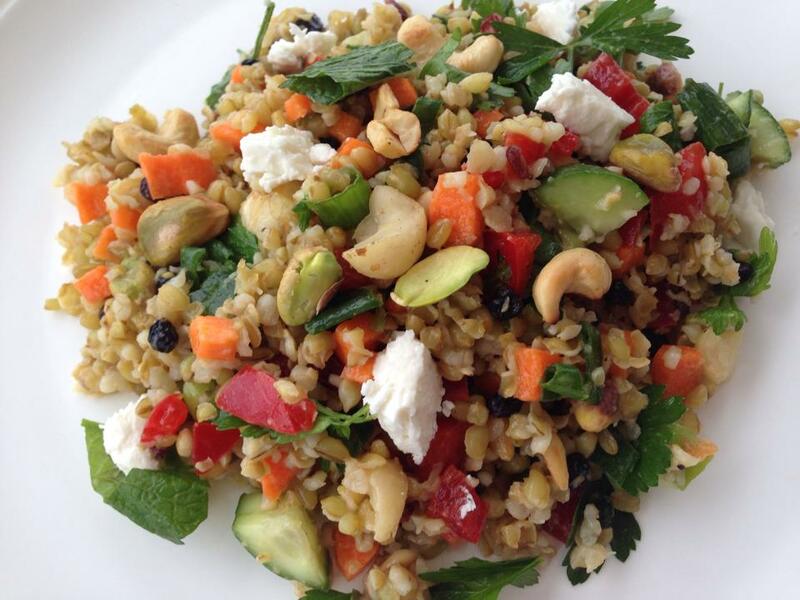 Add all vegetables to freekeh with lemon juice, barberries, barberry liquid and lime juice and mix well. Adjust salt and pepper to taste. Sprinkle currants and add half the nuts. Add the parsley, mint and shallots. 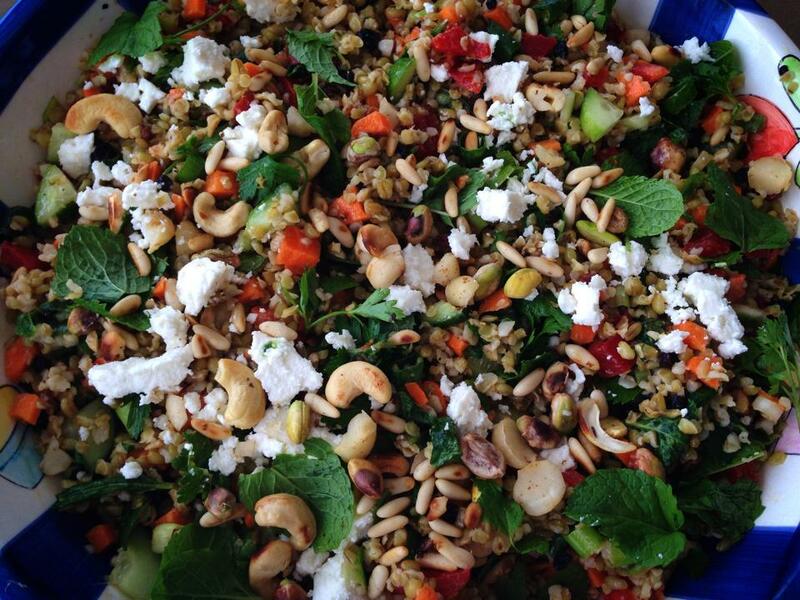 Mix well then sprinkle rest of nuts on top as well as feta. Serve immediately. Tags: cleaneating, culture, diet, food, healthy, inspiration, life, macadamias, salad, vegan, vegetarian. Bookmark the permalink. Good for you for being among the first persons I’ve read to post about Freekeh. Just found out about it in the newspaper recently, myself, and was wanting to try it. Now I’ve got a great recipe for it – thanks! Thank you, and you are most welcome. Glad you will be trying it. Keep me posted please. Excellent! 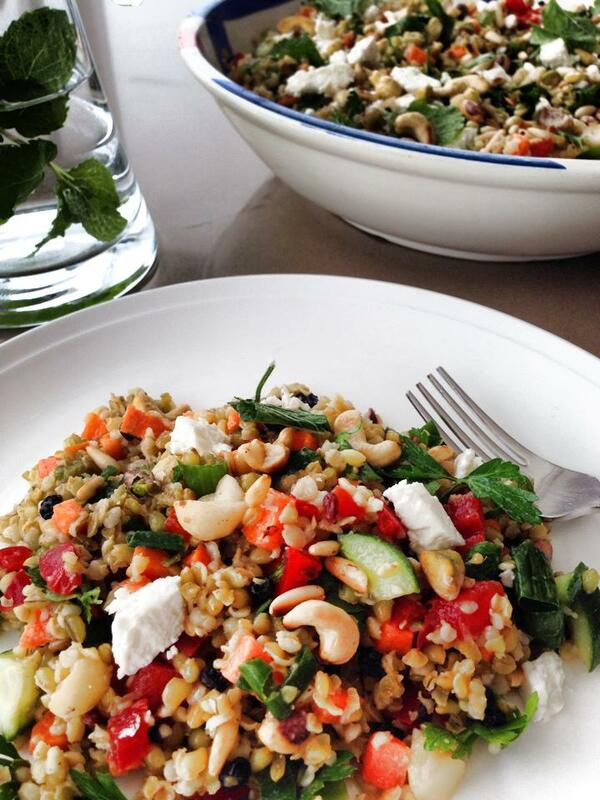 I love freekeh! This looks and sounds great! Isn’t it a delicious grain! Thank you for your lovely comment.